Botanical World Adventures has it all. 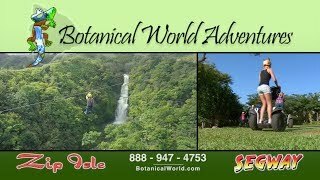 Thrilling, family-friendly zip lines; unique Segway personal transporter tours where you guide your two-wheel segway through the rain forest; waterfalls; a huge maze; magnificent flower gardens; and trails along streams through the lush rain forest. Mountain Apple trees are flowering! Call us to book your very own tour today!